Philippines Gems, according to the online voting contest organizer Isla Lipana & Co., are emerging tourist destinations across the country that deserve to be promoted here and abroad. In a press release posted at the website www.pwc.com.ph, Isla Lipana announced Lake Sebu among the top ten Philippine Gems along with Apo Island, Batanes, Biri Rock Formation, Calaguas Islands, Caramoan, Danjugan, , Mt. Kanlaon, Panglao Island, and Tubbataha. These destinations were chosen from a list of 25 destinations presented for public online voting from June 26 until September 26. Silverio Tandog, program manager of the Allah Valley Landscape Development Alliance said, they envisioned that Lake Sebu to also experience increase in tourist arrival soon. Tandog cited as an example, massive increase in tourist arrival in Puerto Princesa Underground River after winning the search for 7 New Wonders of Nature. “This is because the organizers of the online voting contest would do the bullish marketing for Lake Sebu,” he said. “We hope that this would translate to more tourists becoming interested on Lake Sebu,” Alfred Allaga of the Local Governance Program for Local Economic Development (LGSP-LED), told reporters in the same press conference. Together, AVLDA and LGSP-LED are developing Lake Sebu into a sustainable eco-cultural tourism site. Allaga disclosed that at present, the bulk of visitors in the area are domestic tourists who come to Lake Sebu for day tour and return to either Koronadal City or General Santos City for night accommodation. But at present, he pointed out, none of the ten resort operators in Lake Sebu are international standards compliant. Meanwhile, Nelly Nita Dillera, regional director of the Department of Tourism (DOT) 12 said that preparations are underway to build up the area for the coming of more visitors from other parts of the country as well as tourists from abroad. Recently, she said DOT 12, along with AVLDA and LGSP-LED, has embarked in a massive information drive to encourage primary service providers such as hotels and resorts in Lake Sebu to undergo accreditation. As result of this drive, the regional tourism director explained further, owners of Punta Isla Lake Resort have requested DOT 12 to help them look for designers and architects. “We have linked them with architects who have expertise on construction of buildings on slopes,” she said. Regarding, readiness of resorts to accommodate foreign visitors, Tandog believes owners of facilities in Lake Sebu are prepared to respond once the demands come. “When the influx of tourists comes, most likely, these resort operators will be ready to immediately upgrade their facilities to comply with the standards,” he said. Visitors usually come to Lake Sebu for an adventure at the 7 Falls zipline, a tour on the main lake, also called Lake Sebu, and a taste of local delicacies made from Tilapia. 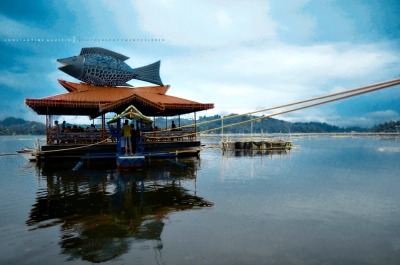 Besides Lake Sebu, the town has two other lakes, namely: Lahit and Seloton. Lake Sebu is also home to the National Living Treasure Lang Dulay who weaves T’nalak cloth from her dreams. It is also being developed for bird-watching and caving.